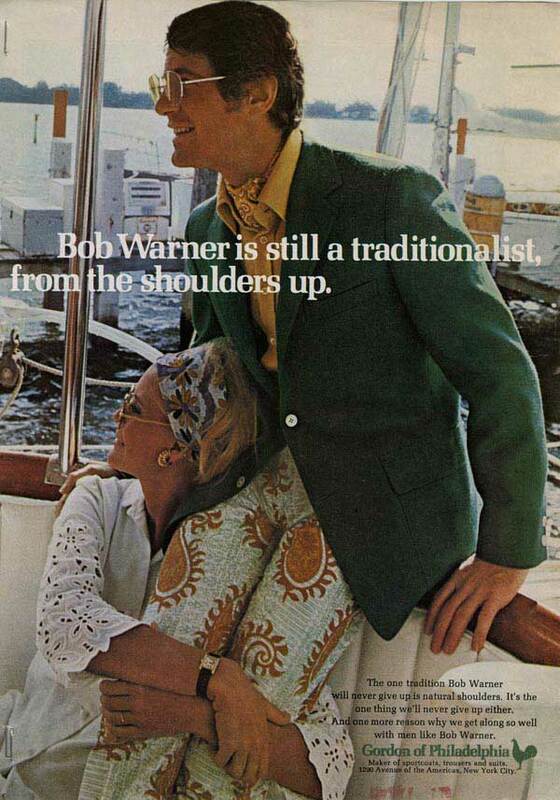 Post contributed by Josh Larkin Rowley, Reference Archivist for the John W. Hartman Center for Sales, Advertising & Marketing History. In 2016, a small group of researchers and project managers descended upon the Rubenstein Library reading room. They were from the company Adam Matthew Digital, a U.K.-based builder of primary source digital databases for use in teaching and research. Over six weeks and three trips, they were firmly ensconced in research in our reading room from when we opened at 9AM—pausing only for meals—until we closed. 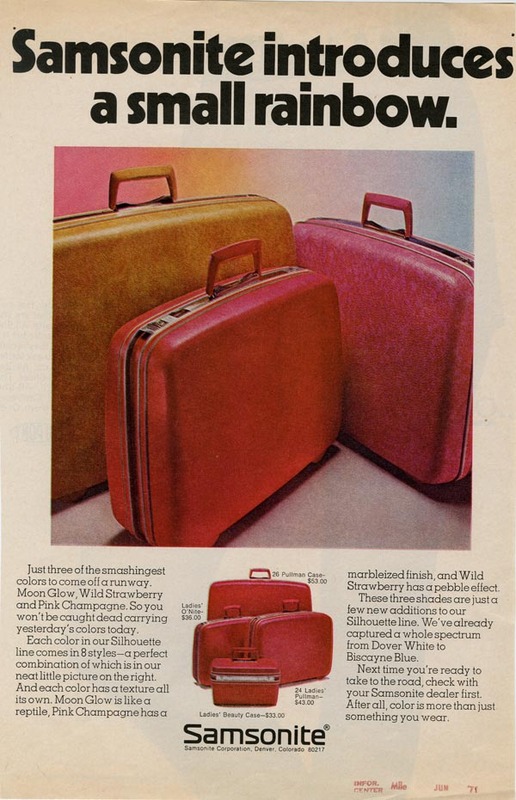 They perused hundreds of boxes from the Hartman Center for Sales, Advertising & Marketing History’s archives of the J. Walter Thompson Co., an advertising agency founded in New York City in 1864. 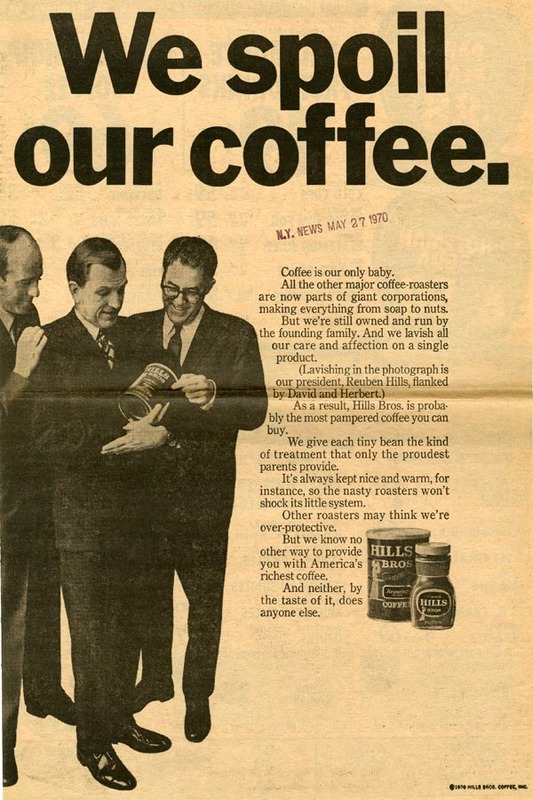 Considered the most complete record of any existing advertising agency, the archives documents 150 years of the agency’s work with hundreds of business clients, corporate culture, personnel, marketing research, and contributions to the advertising industry. 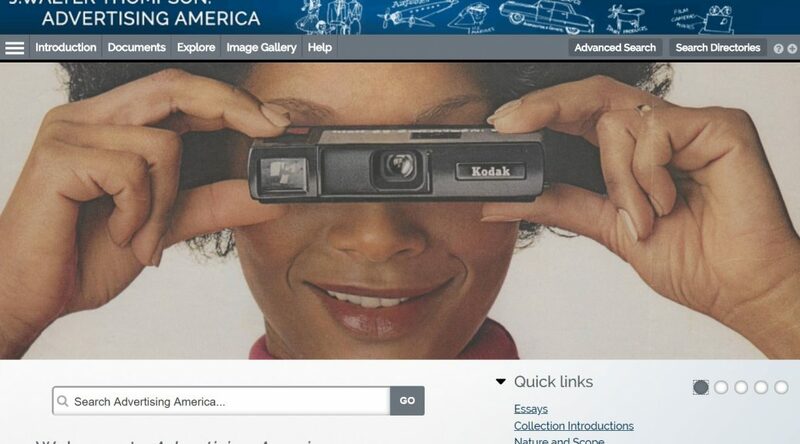 The goal of Adam Matthew’s research was to build a digital database that captured the essence of the agency and its contributions to American consumer culture. 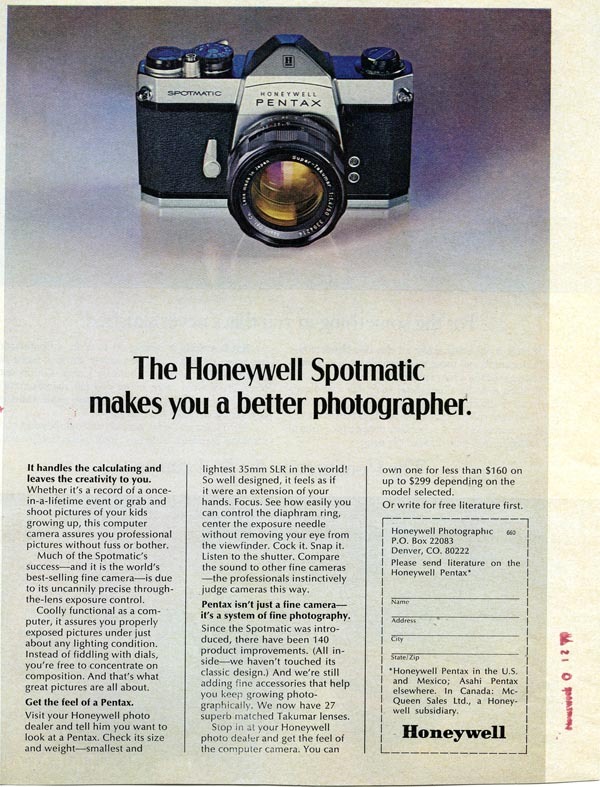 Homepage for J. Walter Thompson: Advertising America research database featuring 1972 Kodak ad from the JWT Advertisements Collection. Thanks to the work of Adam Matthew Digital, Backstage Library Works, our own Digital Collections & Curation Services, and several Duke student assistants, the database is now complete and available to institutions for purchase. 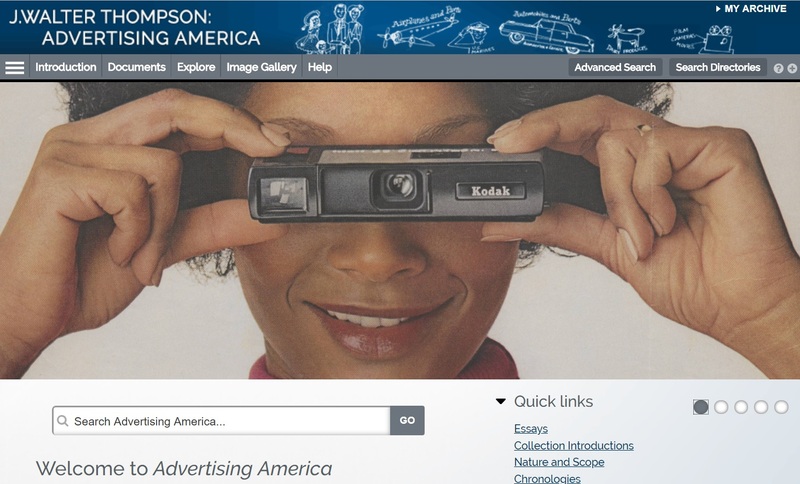 Titled J. Walter Thompson: Advertising America, the database includes print advertisements, writings and speeches by JWT staff, company publications, account materials, company newsletters, market research and reports, meeting minutes and much, much more. 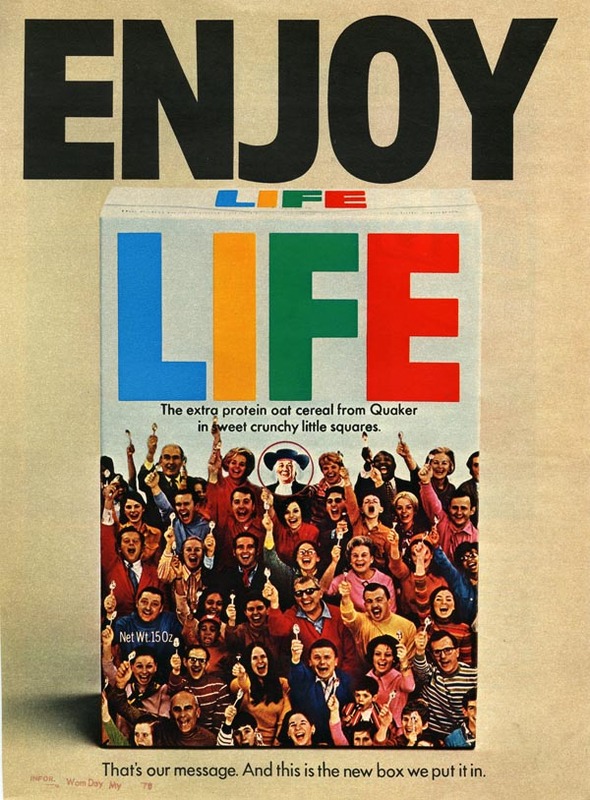 Together, these materials not only document the story of one of America’s oldest and most enduring advertising agencies, but they also reveal many aspects of 20th century history. Researchers interested in facets of business, social, economic, and cultural history are sure to find the database a rich resource. 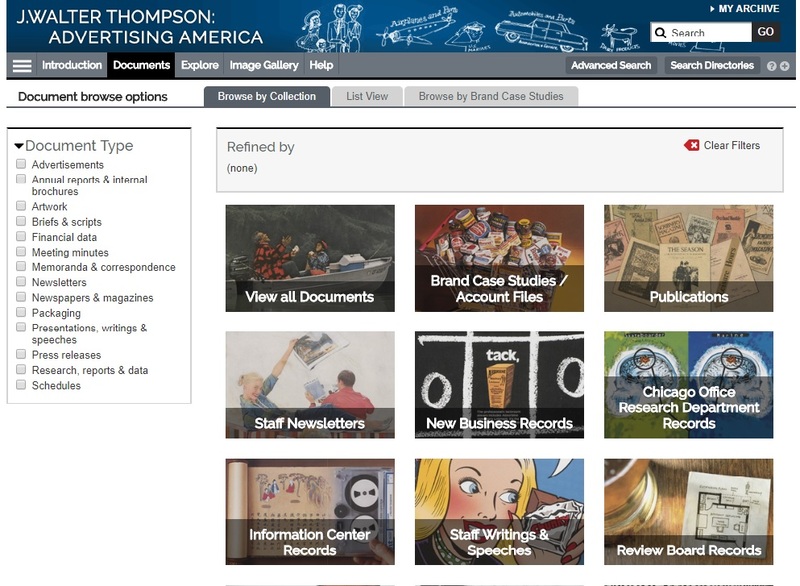 “Browse by Collection” page for J. Walter Thompson: Advertising America research database. If you are interested in purchasing the database for your own institution, inquiries can be sent to Adam Matthew Digital website here. 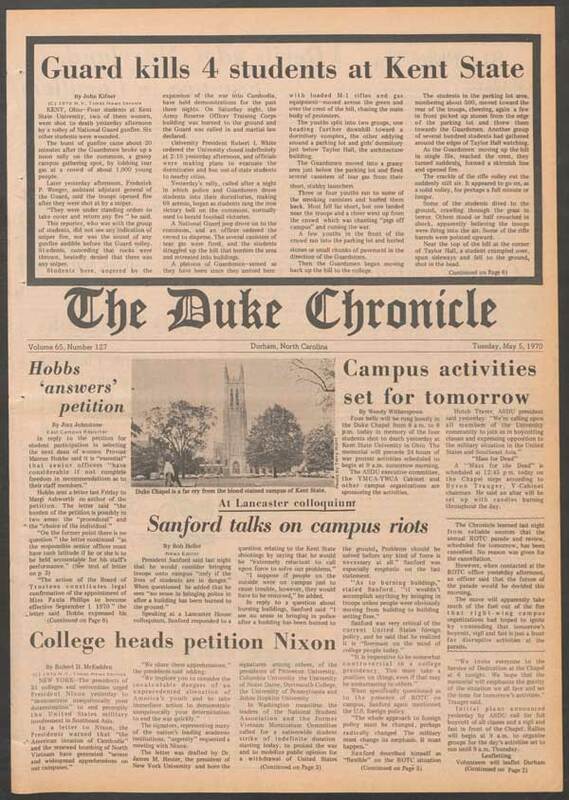 The database is free to Duke students, faculty, and staff in the Libraries’ collection of resource databases here. 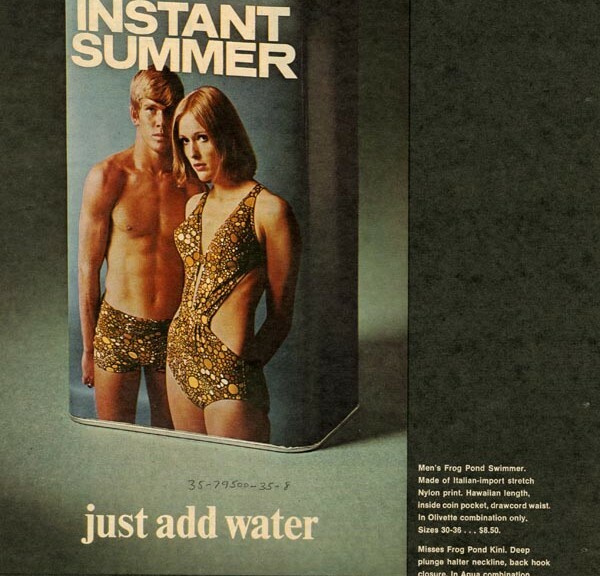 You might be surprised to learn that advertising agencies have a long history of recruiting female employees. 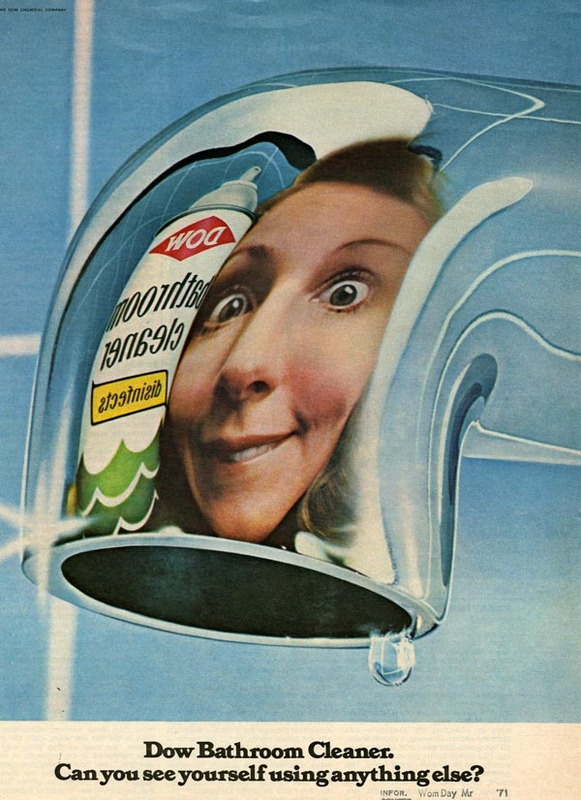 Compared to other corporate fields, ad agencies developed fairly progressive attitudes towards women’s employment as early as the late nineteenth century. At that time, women wrote advice manuals for those seeking to build professional careers. One such book, Occupations for Women (1897), contains an entire chapter on advertising. That chapter notes: “A business field which women are exploring with success is that of advertising […] So clever have women proven themselves in this special line, that hardly a manufacturer having goods toward which he wishes to attract attention, fails to avail himself of their availability.” Encouraged by the descriptions in these manuals, women entered into clerical work at ad agencies. Some of them earned promotions, becoming copywriters or market researchers, among other advanced positions. Irene Sickel Sims was one such pioneering woman who we’ve already profiled in The Devil’s Tale. She worked as an assistant advertising manager and chief of copy for the retail advertising bureau of Marshall Field’s Department Store in Chicago in the 1910s and 1920s. 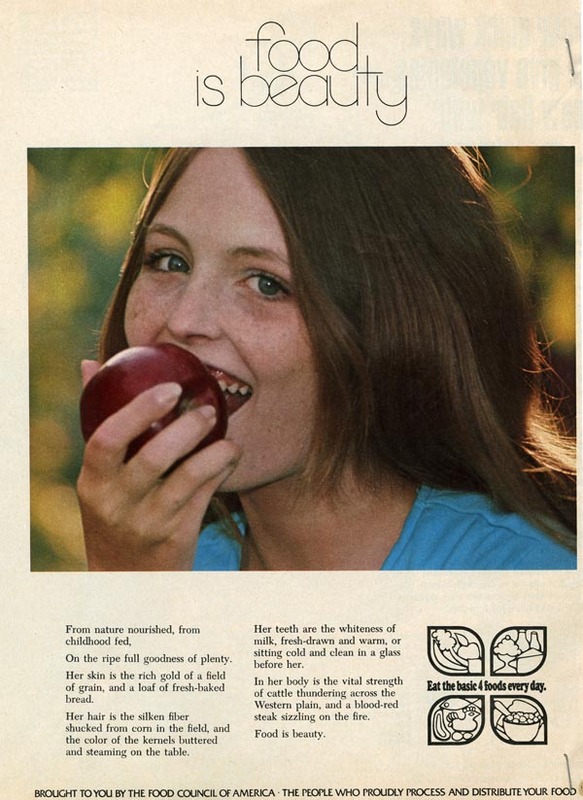 Agencies understood that female advertisers and diverse perspectives were key for successfully marketing to women consumers who made the vast majority of household purchases. 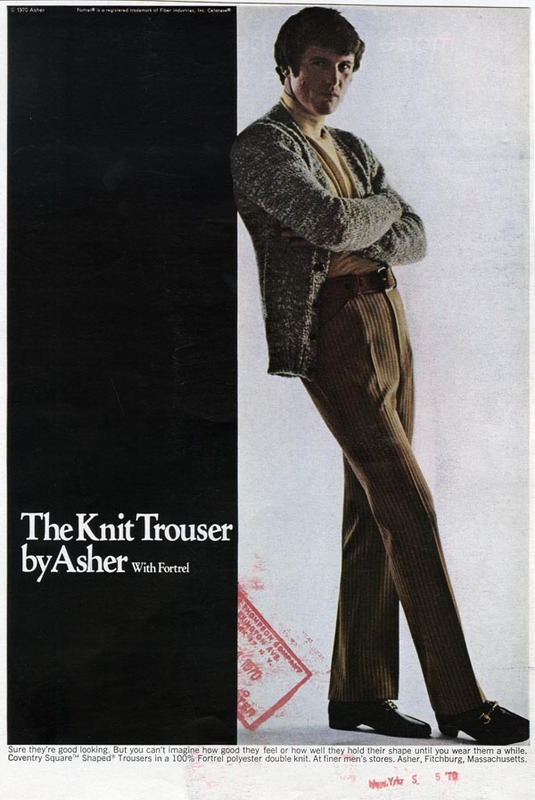 According to a 1917 “house ad” created by the J. Walter Thompson Company (JWT), the company had recently “developed a staff of women” to target the large demographic of female buyers. 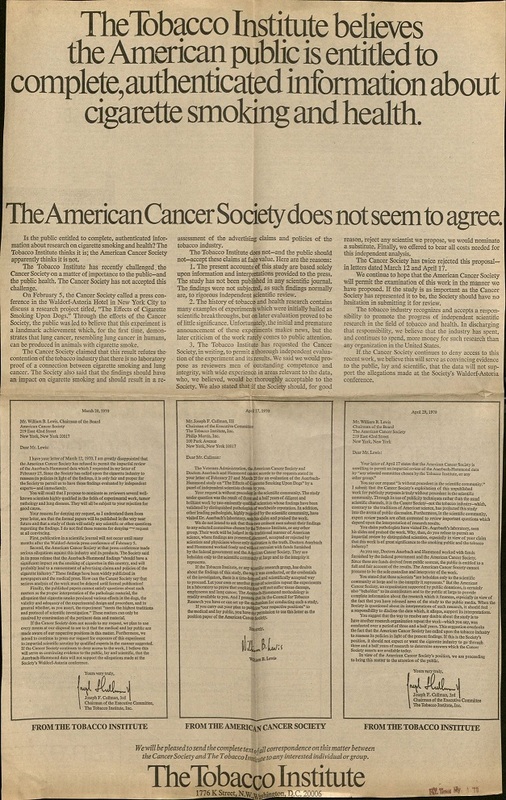 The ad goes on to note that “over a period of years, this staff has illustrated that women, thoroughly trained in advertising, working with men, can establish facts which cannot be even approximated by men working alone.” Those women recruits, hailing from some of the most prestigious universities in the country, created highly successful advertising campaigns for JWT clients. 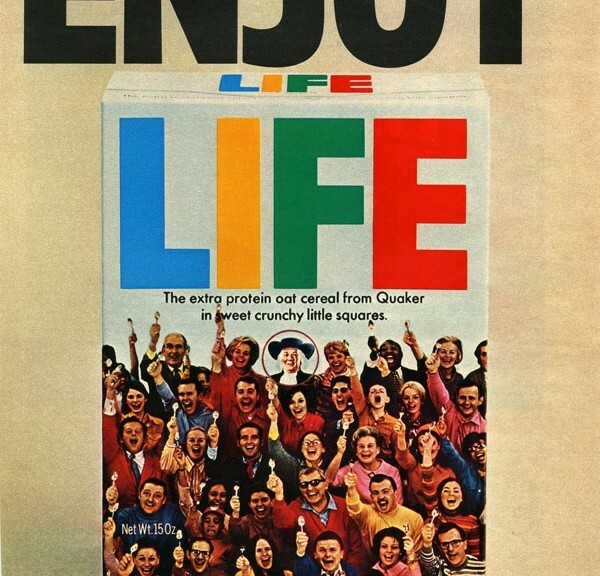 Although some women were able to enter into the field of advertising in roles beyond that of a typist or executive assistant, the majority of employees in executive roles remained white men. It was not until the post-WWII period that significant numbers of women and people of color began taking on positions as ad executives. Author photo in Patsy Breaks into Advertising. (New York: Dodd, Mead & Company, 1946). 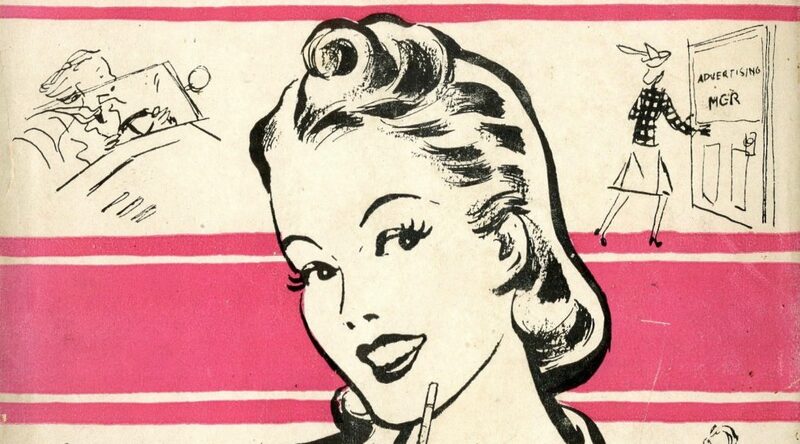 In the post-WWII period, women published fictionalized works encouraging girls to consider advertising as a potential career. 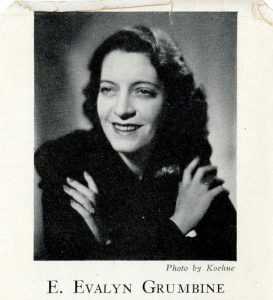 E. Evalyn Grumbine, for example, wrote two novels that tell the story of a young woman who achieves career success in the field: Patsy Succeeds in Advertising (1944) and Patsy Breaks into Advertising (1946). In writing Patsy’s character, Grumbine drew upon her own professional experiences as the advertising director and assistant publisher of Child Life Magazine. Grumbine’s aim was to provide young women with a realistic portrayal of the professional and personal life of a career woman. In Patsy Breaks into Advertising, for example, the main character’s professional journey is marred by setbacks. Over the course of her burgeoning career, she deals with missed job opportunities, personality conflicts with work colleagues, and an inability to meet deadlines. Yet, she shows resilience and learns key skills like how to handle copy and cuts for production that enable her to eventually earn a position as an advertising manager. 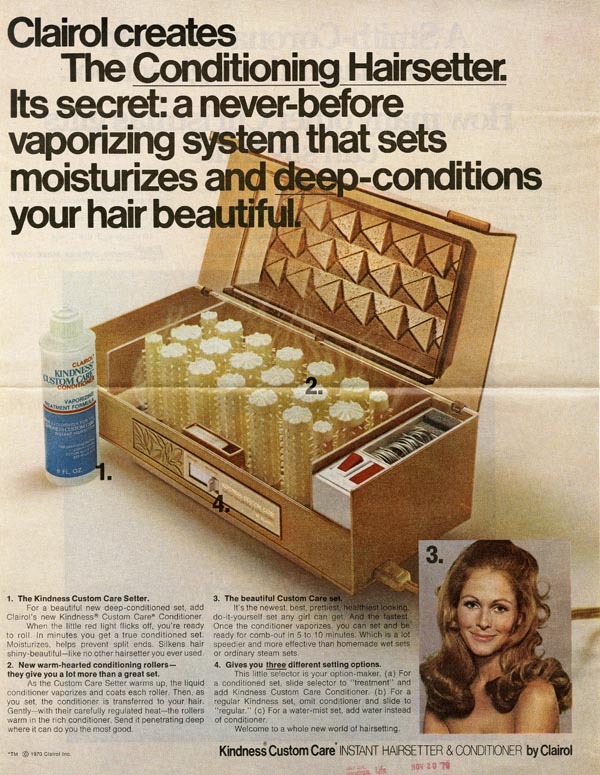 Patsy Breaks into Advertising, therefore, is much more than a career guide, it is also a commentary on the American work ethic at that time. 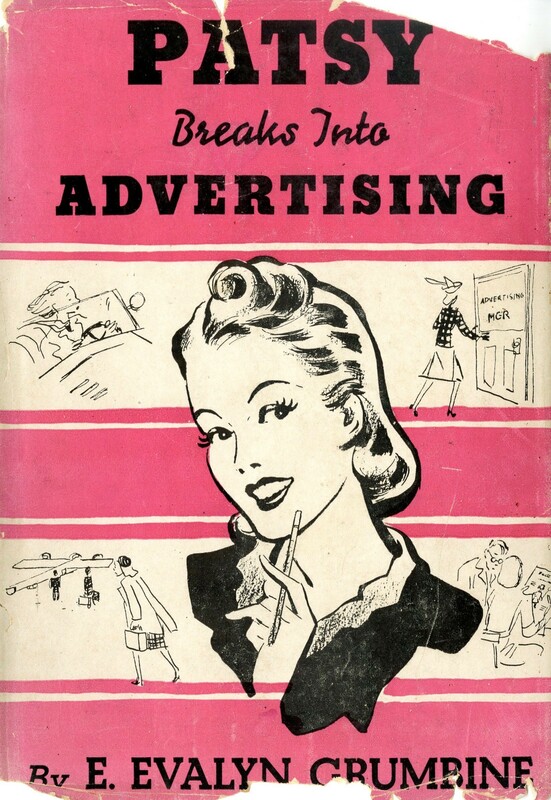 Front Cover, Patsy Breaks into Advertising (New York: Dodd, Mead & Company, 1946). 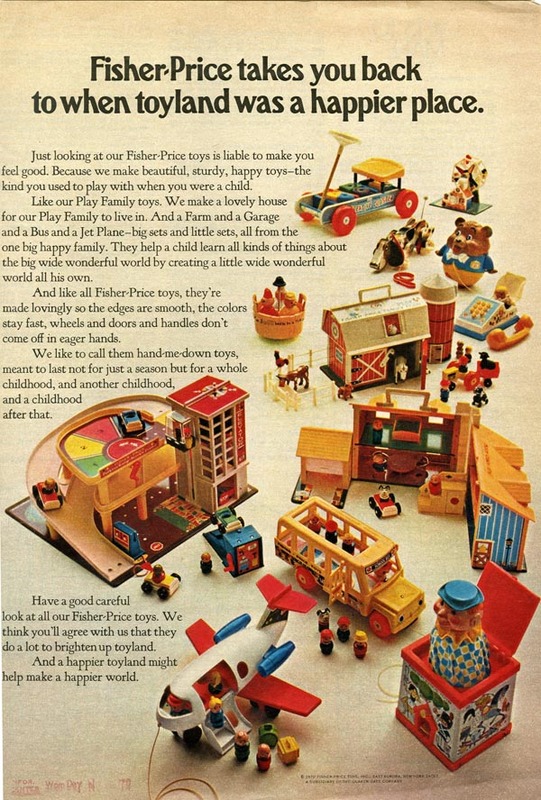 Advertising was one of many professional fields that juvenile literature highlighted in order to encourage industriousness in young women. Other fictional characters included librarians, realtors, nurses, doctors, and stewardesses. The Rubenstein has numerous books in our collections that illuminate societal views on career advancement for young women in the nineteenth and twentieth centuries. 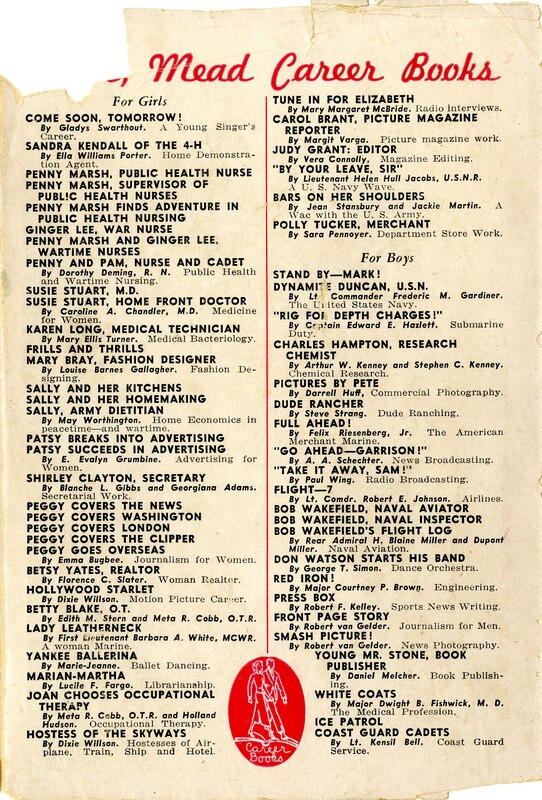 Back cover listing other career books offered by Dodd, Mead & Company, Patsy Breaks into Advertising (New York: Dodd, Mead & Company, 1946). 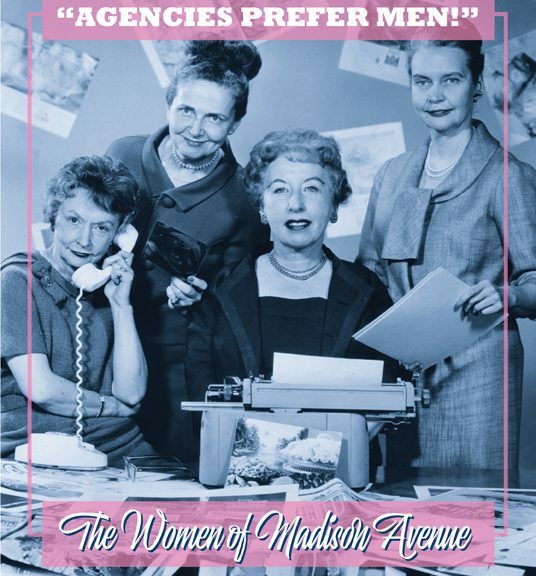 You can learn more about JWT, career books, and the role of women in advertising via the “Agencies Prefer Men!” The Women of Madison Avenue exhibit, open through March 17, 2017 in the Mary Duke Biddle Room at the David M. Rubenstein Rare Book & Manuscript Library. 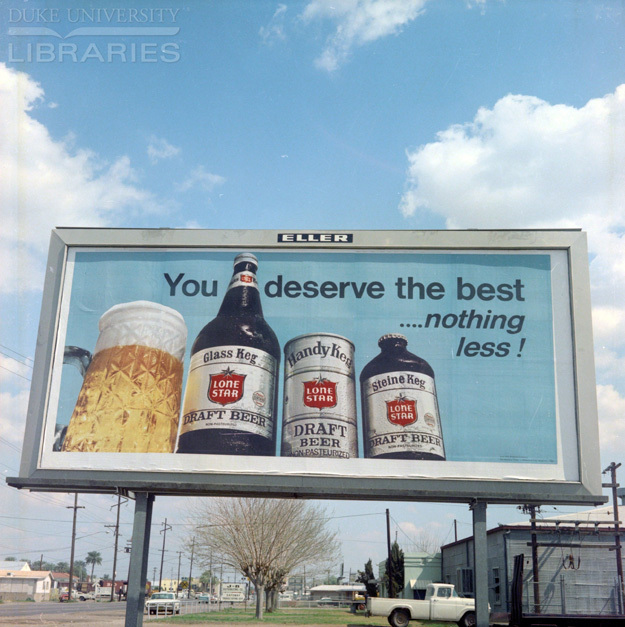 One of the Duke Libraries’ most popular blog series is the Rubenstein Test Kitchen. 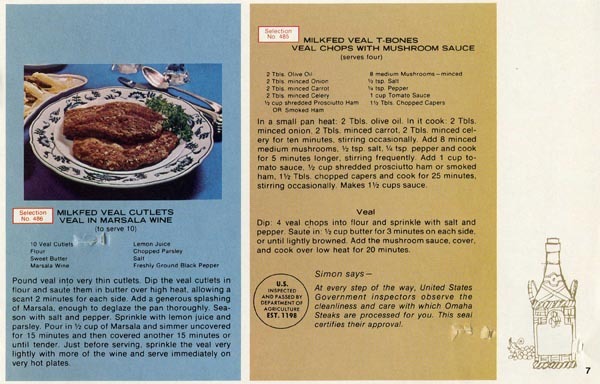 For this series, we invite library staff and affiliated scholars to recreate historic recipes, some of which delight and some of which cause fright (wiggly meat jell-o, believe it or not, isn’t as appealing as it once was to the American consumer). Our contributors exercise a fair amount of creativity and patience as they replicate decades- or even centuries-old recipes. Their trials and tribulations at the stovetop are indicative of the culinary skills and know-how that can be lost in translation. For example, many historic gumbo recipes begin with the phrase, “First you make a roux,” but do not provide instructions for how to actually make the roux. The creators of those recipes assumed that readers would have mastered the challenging technique of slowly toasting flour in fat, which, in the 1800s was common knowledge. Many Americans today, however, would not know how to start a roux or even know that it is a traditional base for sauces and soups. Recipe writing and replication are no easy tasks. Reflecting on our popular posts, a question came to mind: where did test kitchens originate? 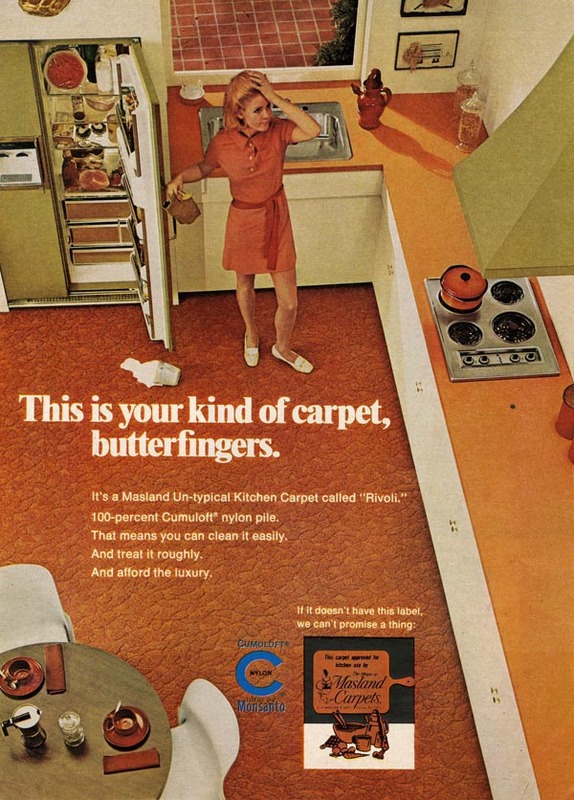 After co-curating our most recent exhibit, “Agencies Prefer Men!” The Women of Madison Avenue, I learned that the early history of test kitchens is actually tied to advertising agencies. 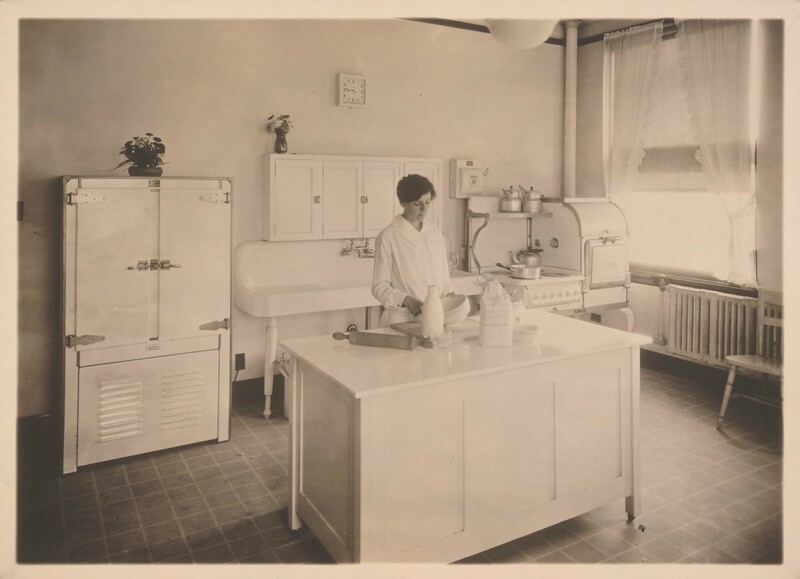 J. Walter Thompson’s Chicago office test kitchen, 1919. 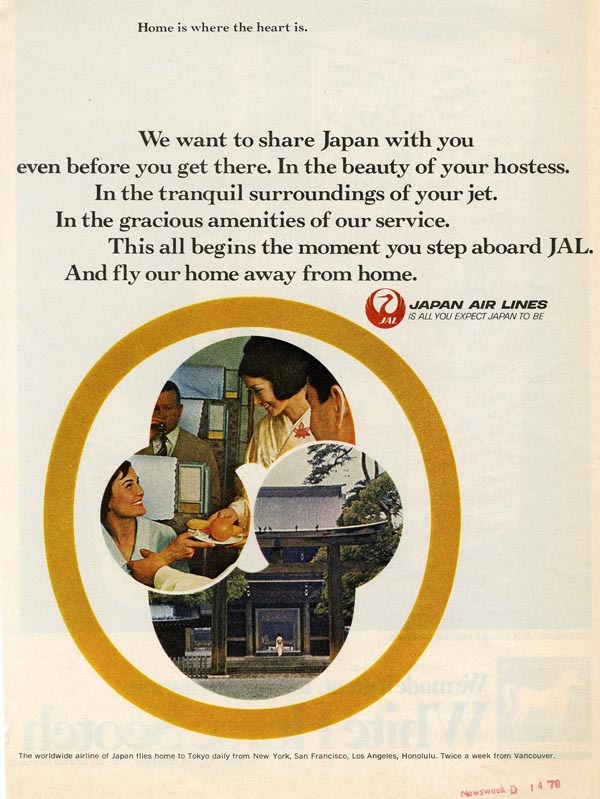 JWT Archives, Iconographic Collection. 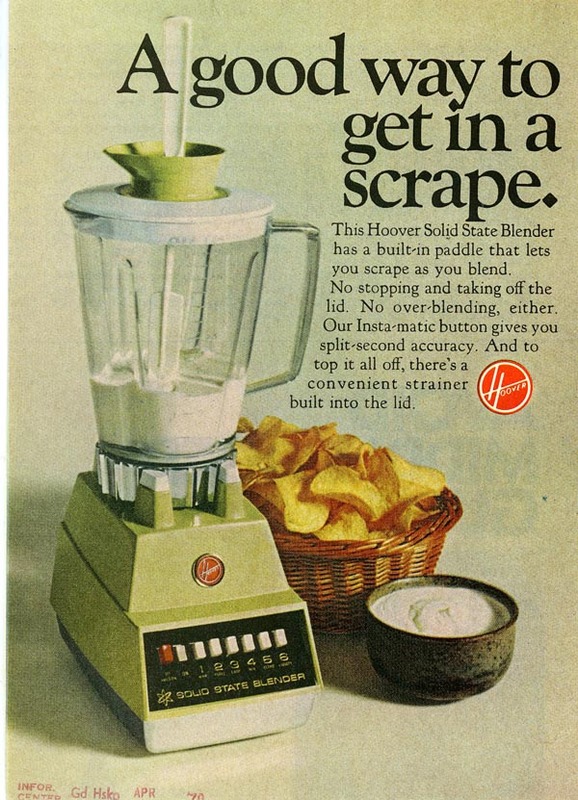 In 1919, the J. Walter Thompson Company (JWT) was the first advertising agency to invest in an on-site home economics service and test kitchen. 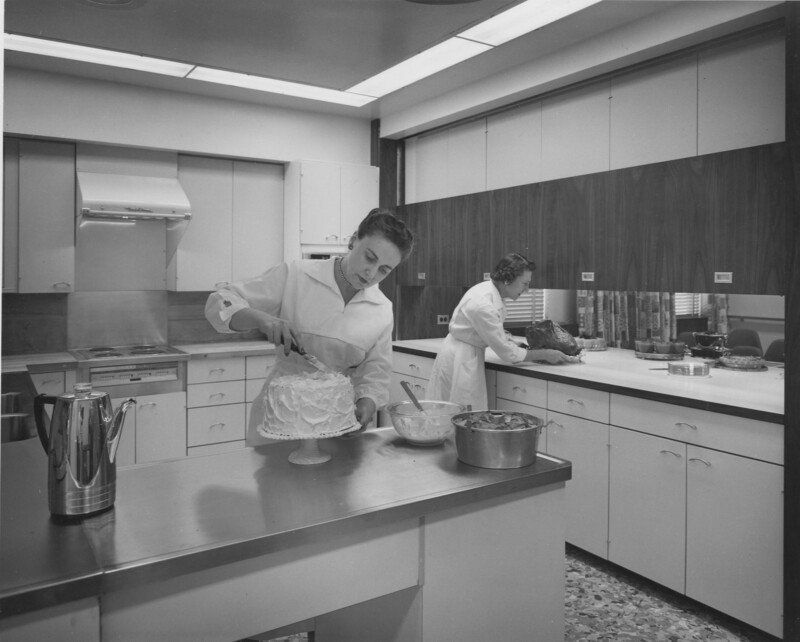 The initial purpose of the kitchen, according to the JWT News Bulletin, was simple: “to invent and test recipes” in order to instruct women “how to get the best results with the greatest economy.” The kitchen was located in the Chicago office, which catered to important clients in the food industry, including Libby, Kraft, and Quaker. 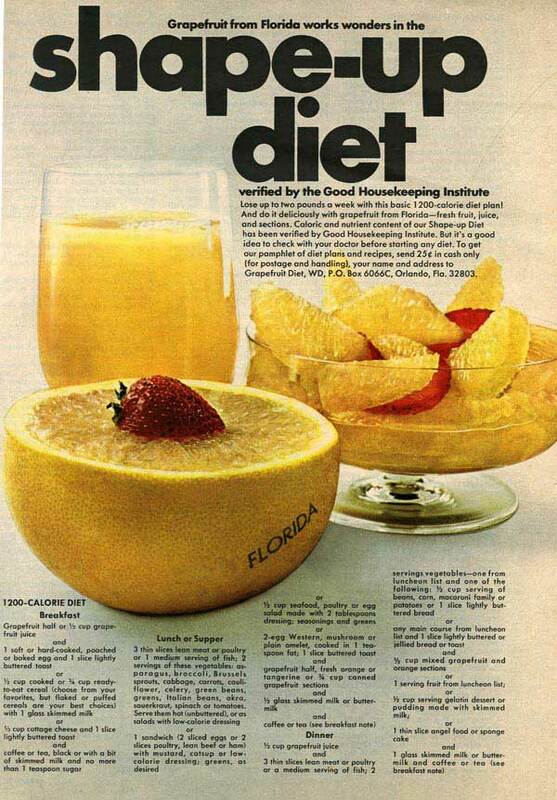 In this laboratory, test kitchen staff also created recipes to include in print advertisements. 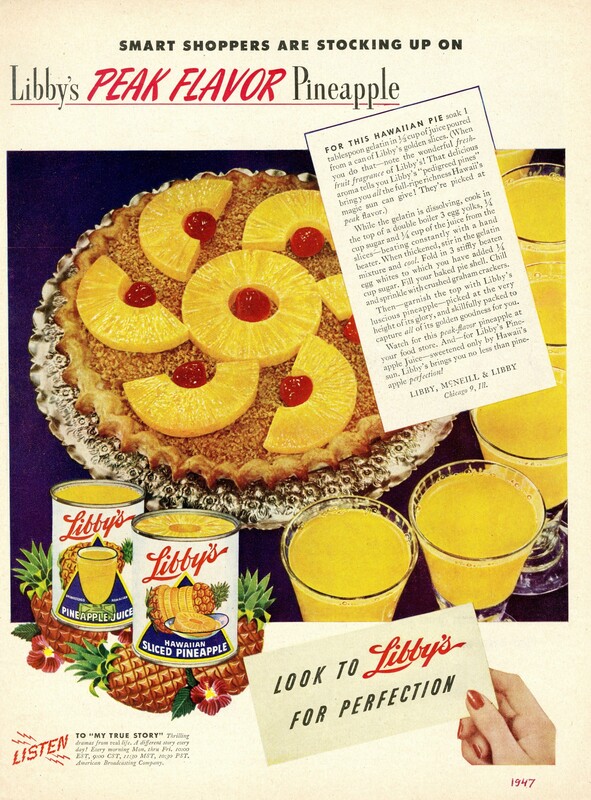 For example, they would have tested Libby’s products like Hawaiian Sliced Pineapple and Pineapple Juice before the agency designed advertisements for publication in magazines like The Ladies’ Home Journal. Libby’s advertisement, 1947. 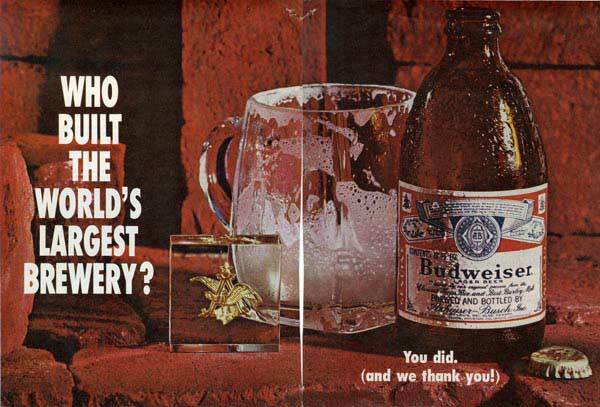 JWT Archives, Domestic Advertisements. 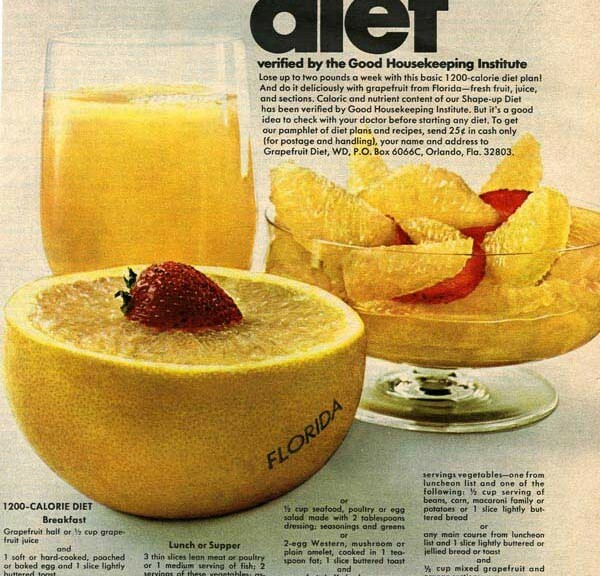 In time, the test kitchens of JWT not only functioned as places to present foods more effectively in advertising, but also as places that defined the trajectory of American cooking. 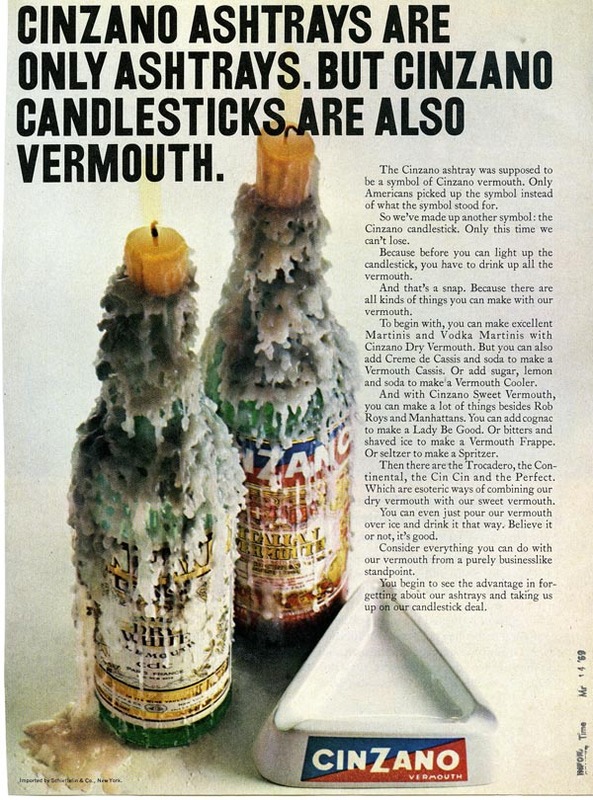 As reported in the September 1958 JWT newsletter, the Home Economics Center was “an endless source of food ideas of all kinds.” As a promotion for their client, French’s mustard, JWT created a new recipe for meatloaf that featured a tangy mustard meringue on top of a mustard-laced loaf. The researchers also created a recipe for a heartier pizza crust made with French’s mustard. 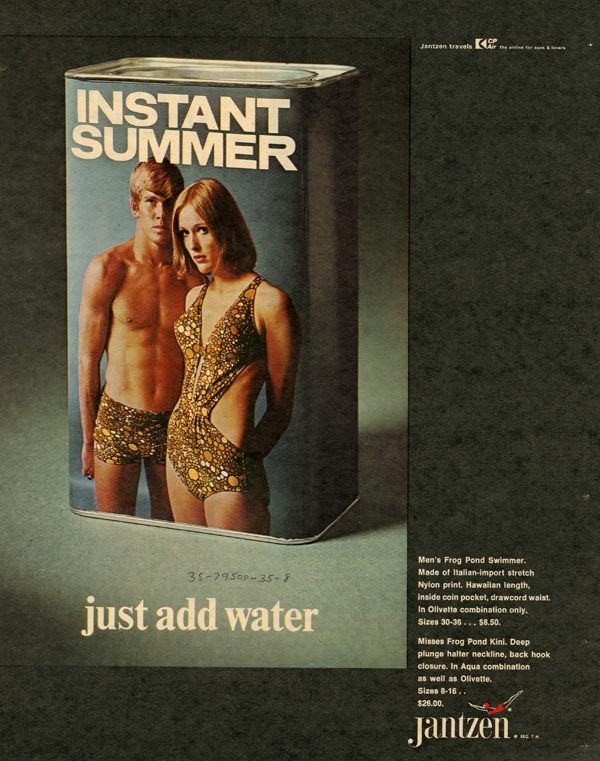 These innovative uses for ordinary products helped boost sales for many of JWT’s clients, bolstering the company’s reputation as one of the most dynamic and influential advertising agencies in the world. 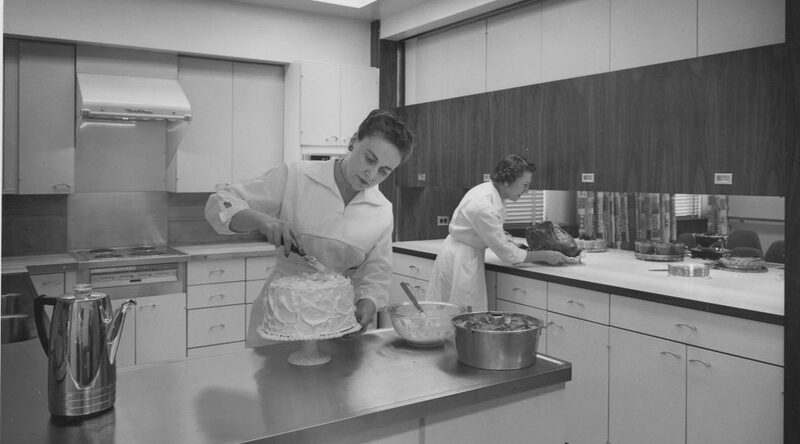 J. Walter Thompson’s Chicago Office Test Kitchen featuring Mabel Anderson (left), the head of the Home Economics Division, and Mildred Stull (right), 1958. 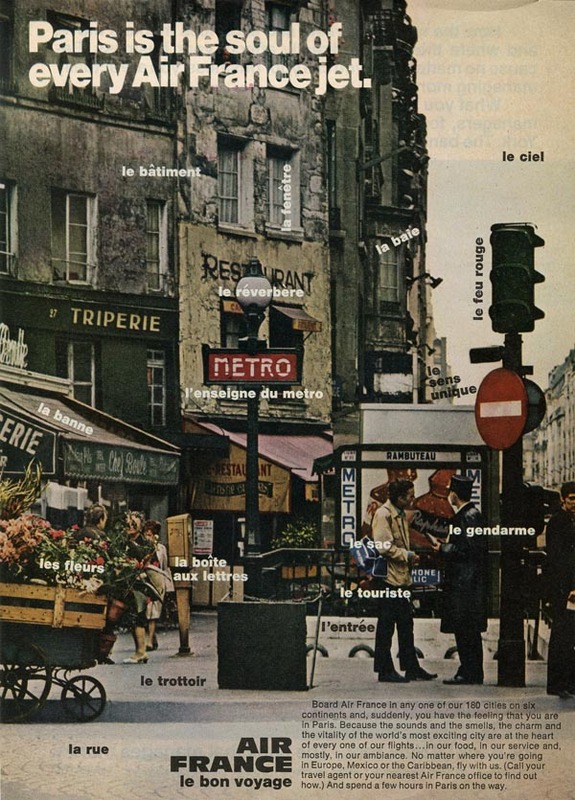 JWT Archives, Iconographic Collection. As we ready ourselves for the next round of Rubenstein Test Kitchen posts, I hope that our contributors think back on the paramount role that test kitchen researchers played in the making of the modern American palate, including the fascinating recipes preserved in our archives. 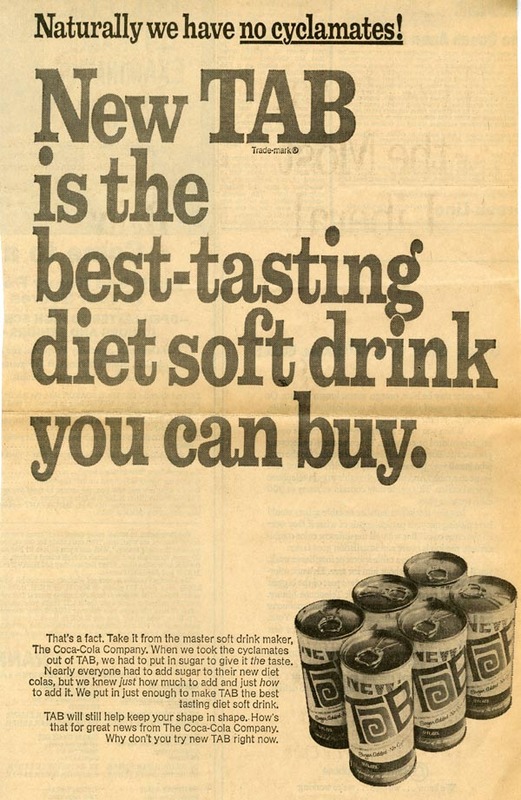 You can learn more about the JWT test kitchen researchers and their contemporaries in advertising via the “Agencies Prefer Men!” The Women of Madison Avenue exhibit, open through March 17, 2017 in the Mary Duke Biddle Room at the David M. Rubenstein Rare Book & Manuscript Library. Join the Hartman Center in celebrating its 25th Anniversary with its second event in the anniversary lecture series focusing on Women in Advertising. Helayne Spivak, Director of the Brandcenter at Virginia Commonwealth University, will speak about the status, achievements, and challenges women face in the advertising industry today as well as reflect on her own career and women mentors she has had. 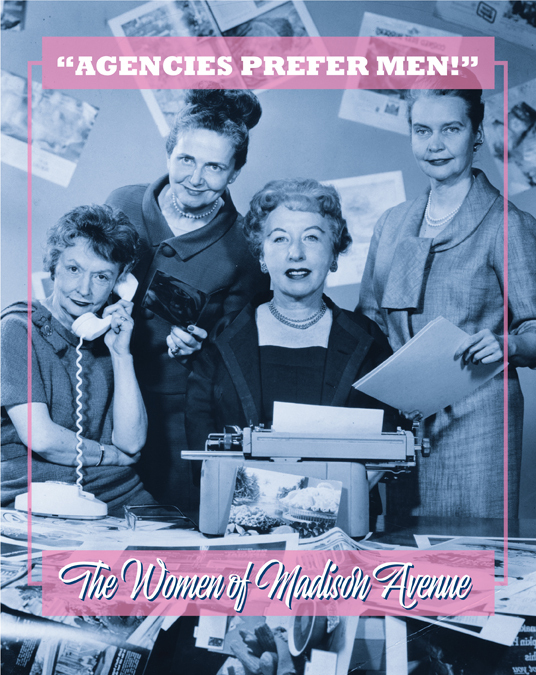 Across the hall in the Mary Duke Biddle Rare Book Room, the Hartman Center will unveil its new exhibit, “Agencies Prefer Men!”: The Women of Madison Avenue. 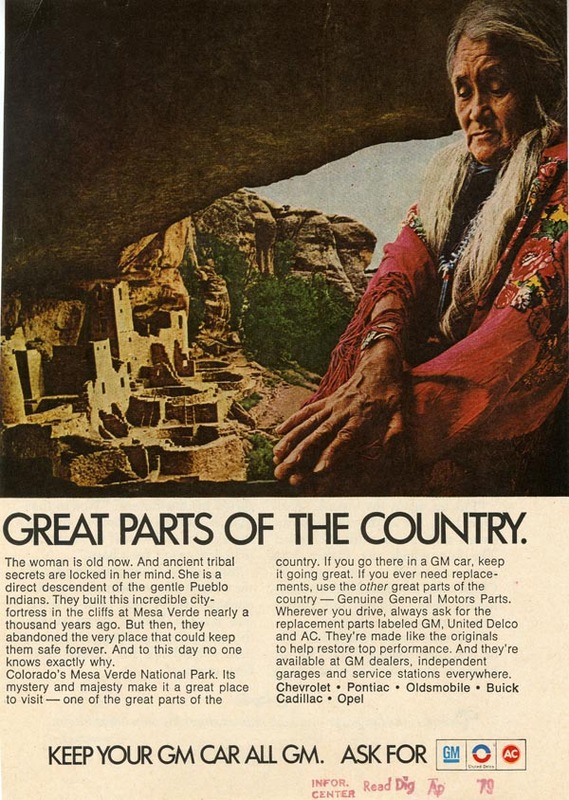 This exhibit uses material from the Hartman Center’s collection to share the long and sometimes hidden history of women in advertising, tracing the career opportunities open to women as they progress from clerical staff to copywriting, art and market research and on to the highest positions in ad agencies as creative directors and CEOs. The exhibit will run through March 10, 2017. The ambiguity! 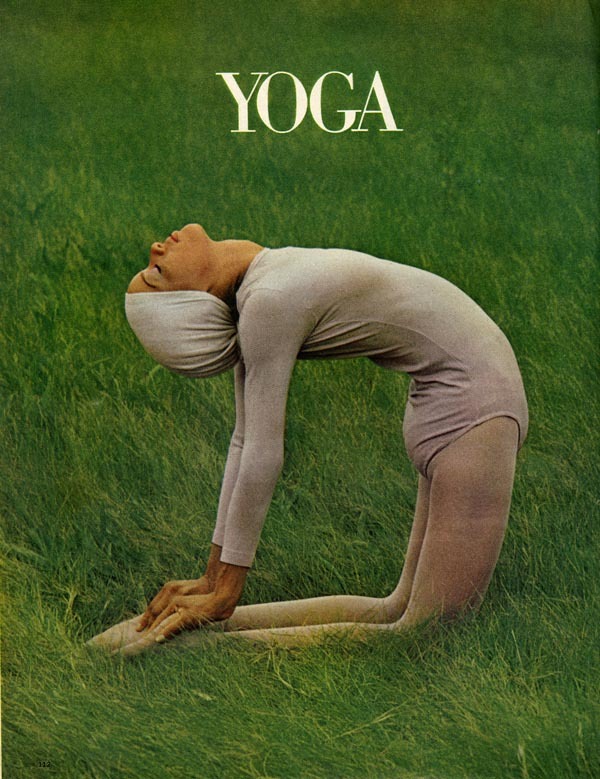 After his emotional awaking with Leonard in the retreat circle, did Don finally find inner peace and decide to leave his New York persona behind? 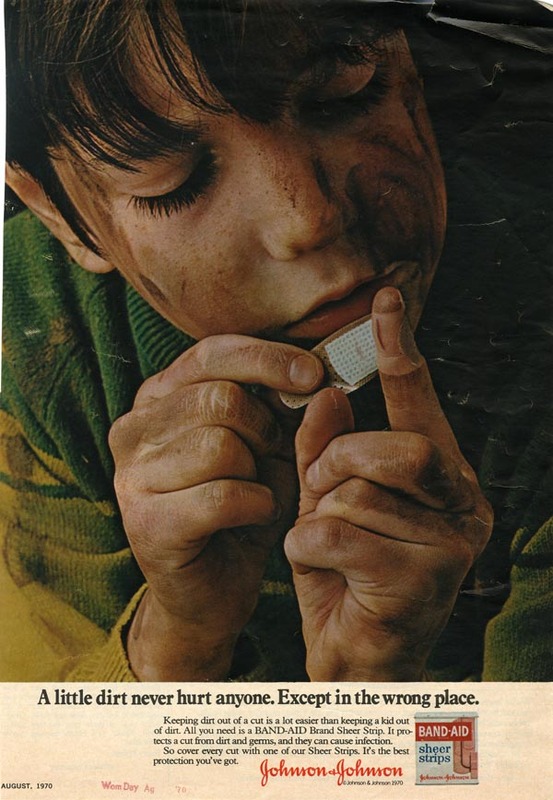 Or did his awakening give him the clarity of vision to return to McCann and write one of the most iconic ad campaigns of all time for Coca-Cola as his sly smile seems to suggest? Are we really left to believe that the only substantive result of Don’s odyssey is that he’s now learned to embrace his cool, calculating cynicism? 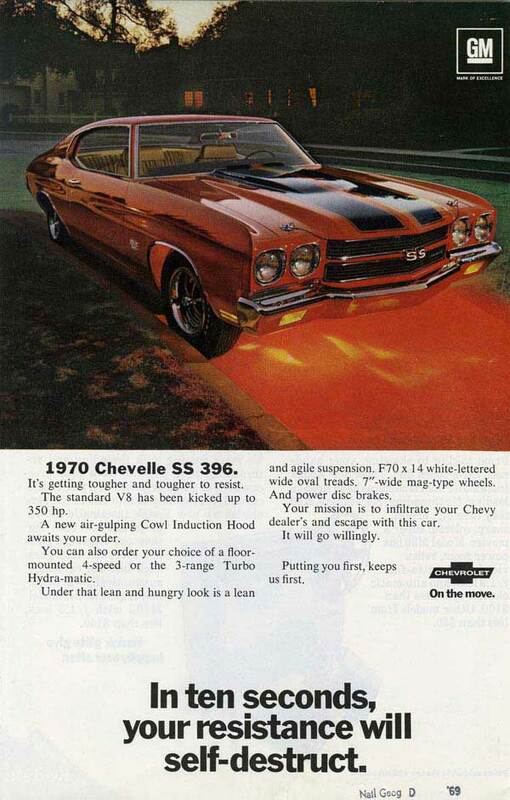 Don streaks across the Bonneville salt flats in a Chevy Chevelle SS and indicates the presence of a shimmy to a couple of gear heads once back in the garage. Despite his transient existence he’s still in touch with Sally, who, during a brief phone conversation, reveals Betty’s illness. Don phones Betty and insists on coming home to be with her and take care of the kids. Betty, in the name of maintaining as much normalcy as possible for them, insists on his continued absence. His absence, after all, has been an important part of their normal. Joan and Richard visit Key West and try cocaine. Referring to her life as “undeveloped real estate,” Richard tries to persuade Joan to leave New York City and take advantage of all he can offer her. Marriage is discussed and dismissed. She later dines with Ken who is seeking the name and number of a producer that worked on the Birds Eye account. She agrees to help. Pete leaves McCann for the last time. Peggy congratulates him and says she is happy for him. Pete says that Peggy will be a creative director somewhere by 1980. Peggy also meets Joan for lunch after agreeing to write the script for Dow’s film. She hands her a check in payment for two more additional scripts. Citing her workload, Peggy demurs. Joan suggests that they partner and turn the work into a production company: “we won’t have to answer to anyone.” Peggy ponders the proposition. Don is dropped off at Stephanie’s house in L.A. Both are worn down by life. In the morning Stephanie leaves for a retreat and insists that Don accompany her. After Stephanie is confronted by a fellow retreat attendee about abandoning her child she leaves Don without saying goodbye . . . and without a ride. Don phones Peggy collect. After chiding him for leaving, she softens and suggests that he’d be welcomed back at McCann if he returns. After all, doesn’t he want the chance to work on Coke? Don says he phoned only to say goodbye. Peggy phones Stan to express her concern and during the conversation he confesses his love for her. After talking out her feelings, Peggy realizes that she reciprocates. Roger visits Joan to let her know that he has decided he wants Kevin in his will. Joan accepts and chuckles when Roger says he is marrying Megan’s mother, Marie. Later Joan cancels a date with Richard in favor of a business meeting. Richard chafes at the time and attention she is devoting to her business that could be given to him. 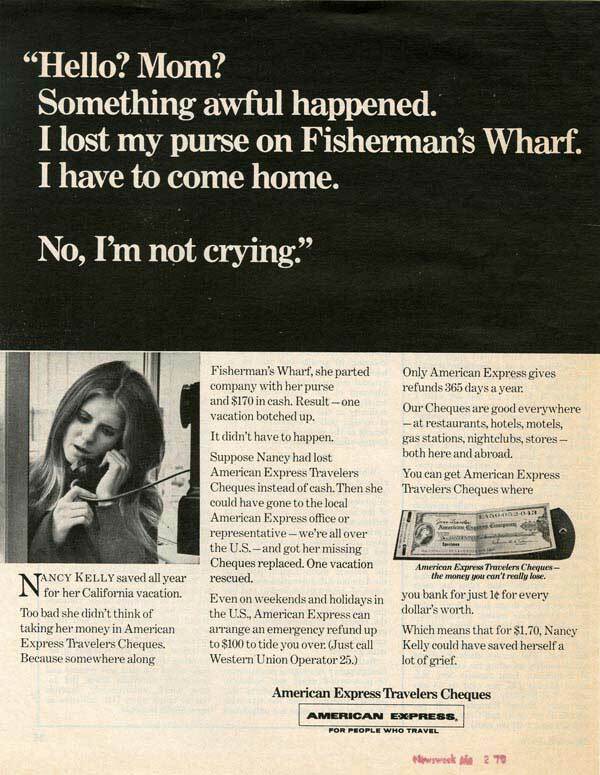 The phone rings and Joan takes the call. Richard wishes her well and leaves. 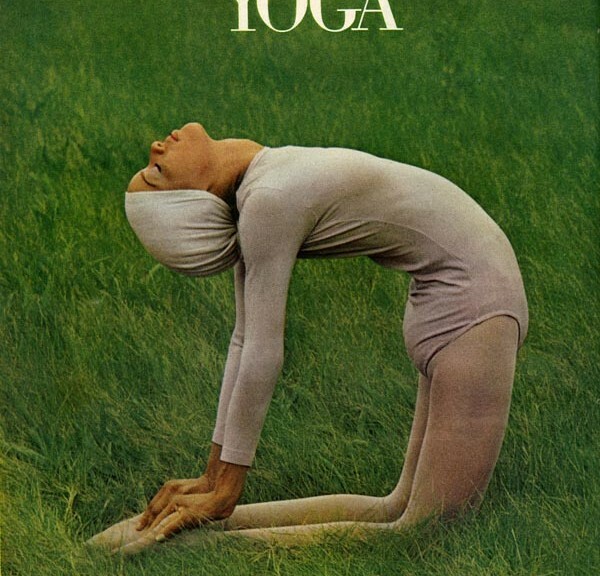 The morning following Don’s emotional awakening with Leonard, he sits in the lotus position on the cliffs above Big Sur chanting a new age mantra. He closes his eyes, smiles, a bell sounds. 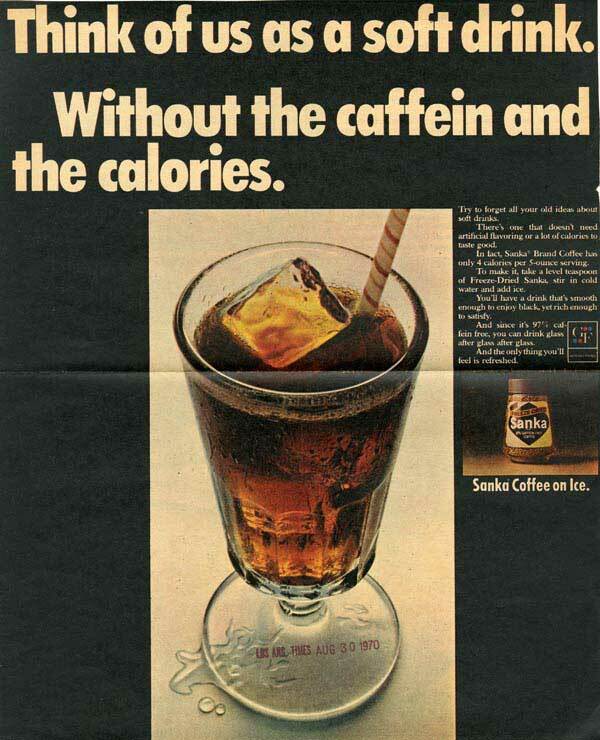 Cue the famous 1971 “Hilltop” Coke commercial with its message of love, harmony, and acceptance. Don has accepted who he is. Last night’s show featured references to Chevy, turtleneck shirts, cookie tins, and the lotus, among other things. 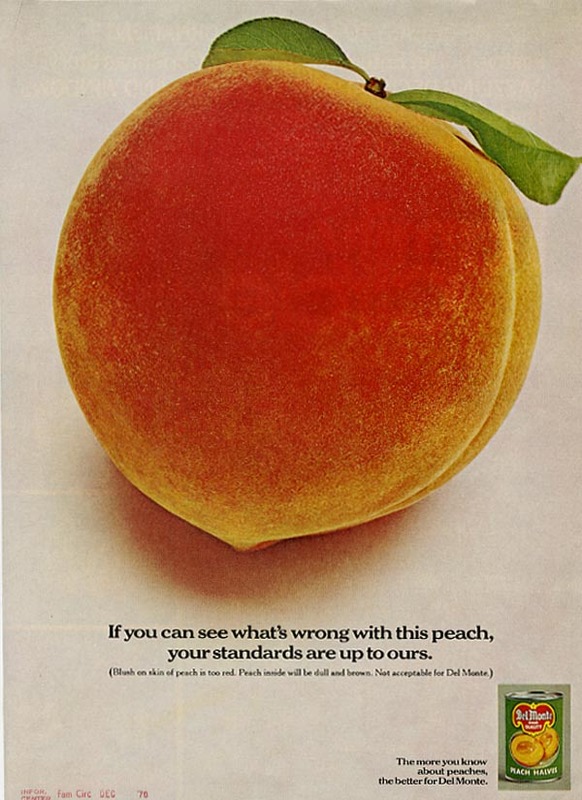 Enjoy our selection of highlighted ads that reflect the brands and themes that Mad Men characters interacted with last night. 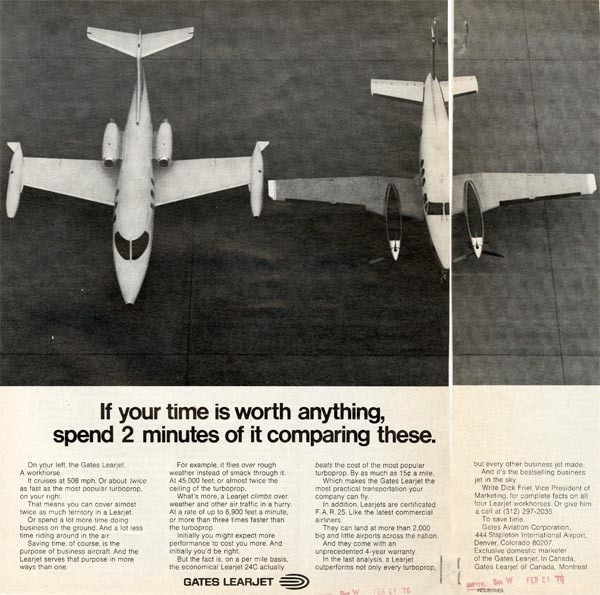 A gallery of our selected advertisements may also be found on Flickr. Post contributed by Josh Larkin Rowley, Reference Archivist for the John W. Hartman Center for Sales, Advertising, and Marketing History. Of course the scene is only a dream and Don wakes in a modest motel room somewhere in Kansas, a long way from the luxury of Manhattan. His vision-quest through Middle America continues south only to be interrupted by car trouble in Oklahoma. He’s dropped at a hotel where he meets the owner, Del, and his wife, Sharon. Sharon tries to convince Don to stick around town for a VFW gathering to benefit a veteran whose kitchen burned down. A day later, Don reluctantly accepts despite a repaired Cadillac and his own rambling spirit. After several shots of Old Crow, a few cans of Lone Star beer, and some prodding from intoxicated vets, Don tells the table that he killed his Commanding Officer in Korea. Later that night, Sharon lets three angry vets into Don’s hotel room who are convince that he stole the cash from the donations jar. They leave without the money but with the keys to Don’s Cadillac which will be held as collateral until the money is returned. Don confronts Andy, a housekeeper at the hotel, about his theft of the money, demands its return, and suggests that he get out of town. 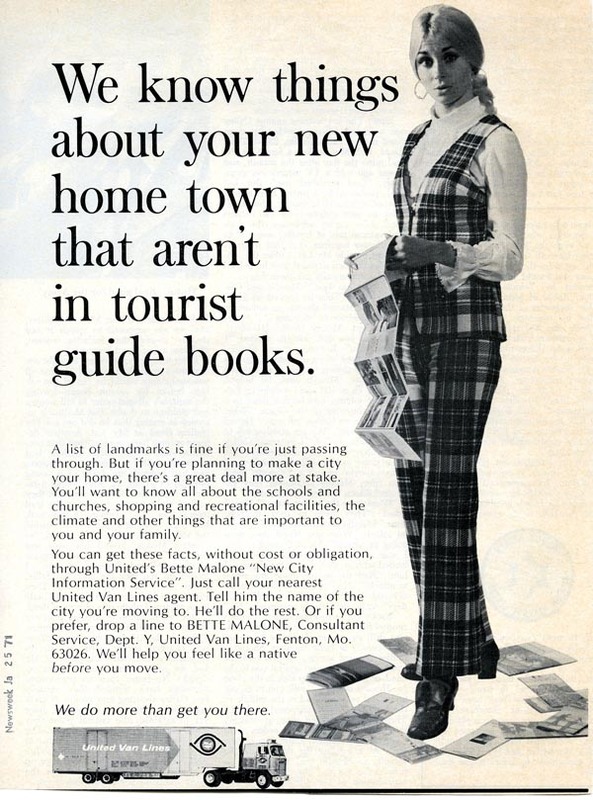 Kindly, Don agrees to drive him to the nearest bus stop where he hands him the car keys and steps out of the car with some sage advice for the budding con artist, “don’t waste this.” His possessions whittled down to what will fit inside a Sears bag, Don looks content. Pete bumps into Duck Phillips on the elevator at McCann and Duck asks for a private conversation in which he tries to convince him to help persuade Learjet to hire him as a headhunter. Pete reluctantly agrees to meet and, over the course of dinner, quickly realizes that he’s been tricked into an interview for the position. Despite Pete’s adamant lack of interest, Duck persists and tries to convince him to attend a second dinner with the spouses. Pete approaches Trudy about her possible attendance at the dinner and in the process reminds her how much she used to love client dinners. Trudy admires Pete for his ability to be sentimental about the past but adds that she, on the other hand, remembers things as they actually were. After Duck spins Pete’s no-show at the dinner as a reaction to Learjets initial salary offer they up it coniderably. Pete shows up at Trudy’s in the pre-dawn hours, tells her of his job offer in Wichita, professes his love, and invites her to move with him and reunite the family. Reluctant at first, she eventually accepts. Betty struggles up the stairs at the university only to stumble and fall, injuring a rib and wounding her pride. At the hospital a doctor requests that she phone her husband as her condition appears to be more serious. In the car after the doctor’s visit, Francis has a tantrum and threatens to sue the hospital for frightening Betty. A second doctor, however, confirms the findings of the first: Betty has an aggressive form of lung cancer and is given months to live. Back at the house, Francis castigates Betty for refusing to seek treatment and accuses her of giving up. Against Betty’s wishes, Francis goes to Sally’s college, gives her the bad news, and enlists her to convince Betty to seek treatment. After brushing off Sally in the kitchen, Betty enters her bedroom that evening for a conversation. Sally accuses her of taking pleasure in the tragedy of her condition. After watching her own mother die slowly Betty simply wishes to spare Sally that same experience. She also hands her a letter with instructions to be opened after her death. Back in her dormitory, Sally reads the letter detailing practical matters such as burial site and Betty’s preferred dress, hairstyle, and lipstick. Betty says she loves her and knows that her life will be an adventure. 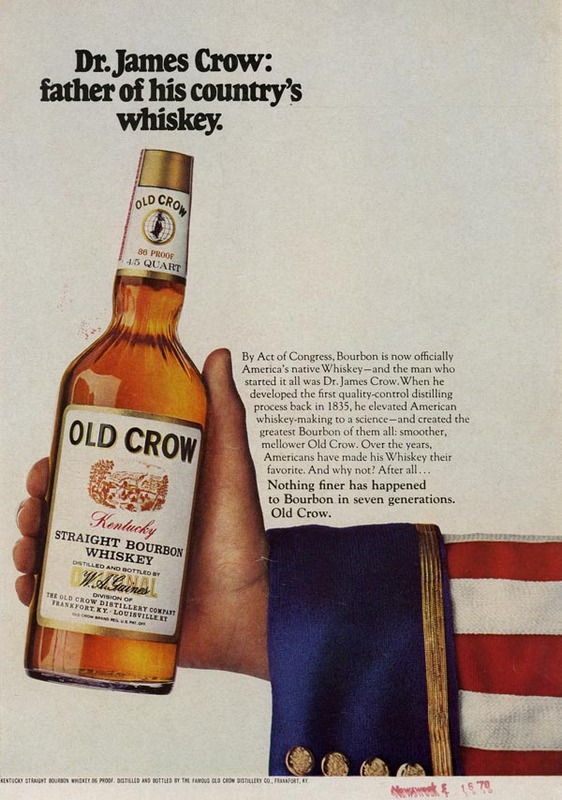 Last night’s episode featured references to apples, Learjet, and Old Crow whiskey among others. 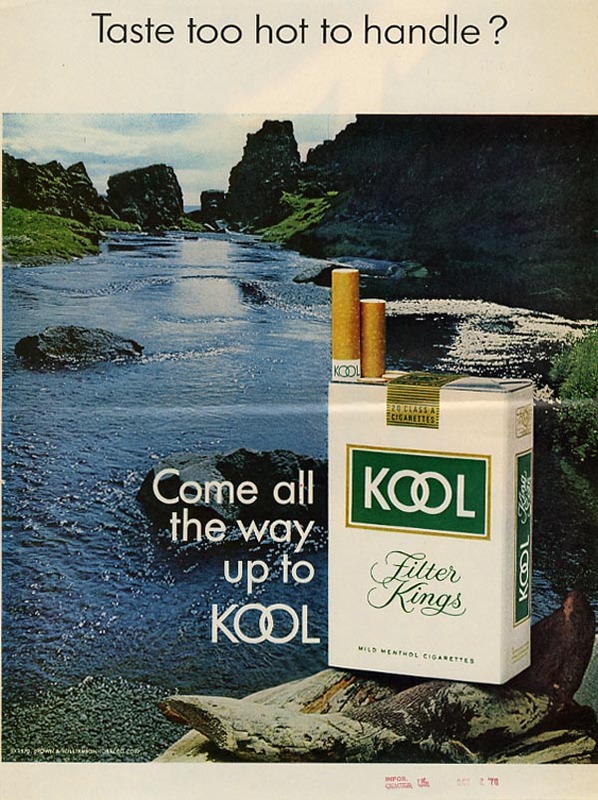 Enjoy our selection of highlighted ads that reference the brands and themes that Mad Men characters interacted with last night. A gallery of our selected images may also be found on Flickr. The characters at SC&P faced their worst fear last night as McCann Erickson planned to absorb and dissolve the agency. With 30 days to vacate their offices and 30 days for Don to find a new place to live, it truly is setting up to be the end of an era. The episode opens on dinner as Ken enjoys toying with Pete and criticizing the work done by SC&P. Roger receives a letter canceling the lease on the SC&P offices. After yelling at some of the secretaries, he calls McCann and discovers that it was not a mistake. McCann is planning to absorb the agency and move everyone into their own building. Roger, Don, Pete, Ted and Joan discuss the news with dread. Stan and Peggy observe and audition children for a client. Stan comments that Peggy hates kids after she struggles working with them. Pete pulls her aside and tells her the bad news about the agency. Lou calls Don and gleefully tells him that he is quitting and moving to Tokyo to work with Tatsunoko Productions on developing his comic into a cartoon. The partners meet and come up with a strategy to move the agency to California where they could work on the clients that are a conflict for McCann. 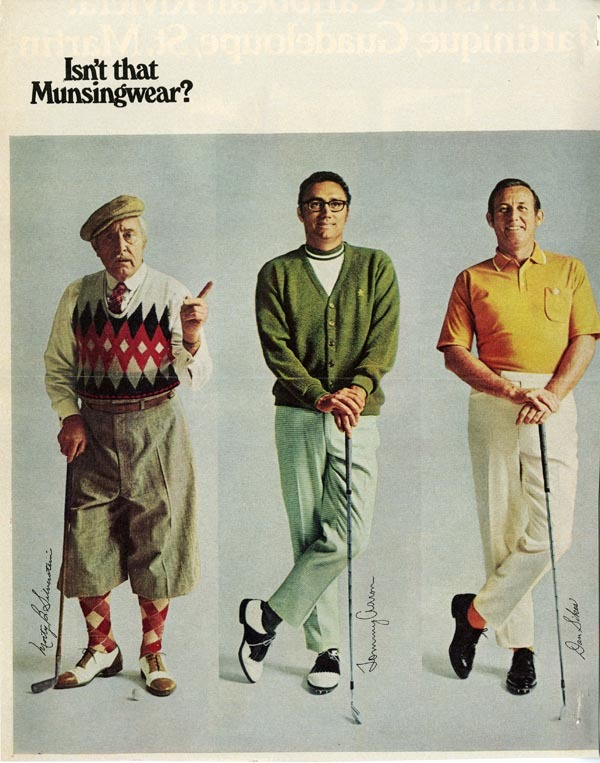 They rush off to see if they can get those clients to stick with them at “Sterling Cooper West.” Roger and Pete meet with Ken to get Dow to stay with them but he refuses and leaves. Peggy meets with a headhunter who tells her that her best bet is to stay and work at McCann. Pete and Trudy meet with the headmaster at Greenwich Country Day school, which rejected Tammy’s application. Pete says that it a family tradition for a Campbell to be at that school. The headmaster bears a grudge dating back to 1692 when his ancestors and Pete’s began a historic clan feud. He insults Trudi and Pete punches him before leaving. Later Trudi bemoans the fact that it is hard being a divorced woman because men try to take advantage of her. Stan and Peggy have to babysit a girl who was left by her mother who had to pick up her son. The girl manages to staple her finger causing an argument between Peggy and the mother who returns. Later Peggy reveals to Stan that she gave a child up for adoption and says it is not fair that women have to make hard choices when men don’t. 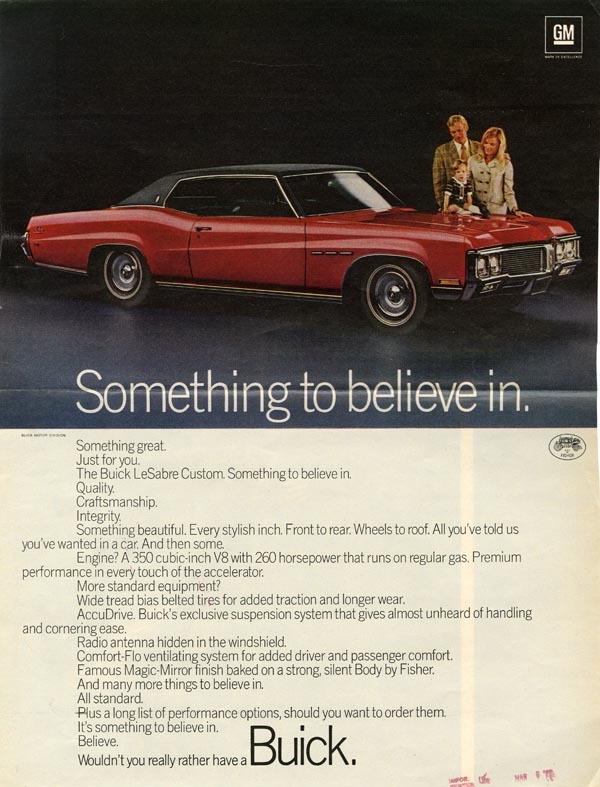 The SC&P partners make their pitch to keep their conflicting clients and move to California, but Jim Hobart explains that they all will have great jobs at McCann working on top tier clients like Buick and Coca Cola. Only Ted seems happy to hear that he will get what he always wanted, to work on a pharmaceutical account. They all leave and commiserate over beer. The next day the partners announce the big news to the office and try to make it sound positive, but the staff quickly start taking over them and walk away. 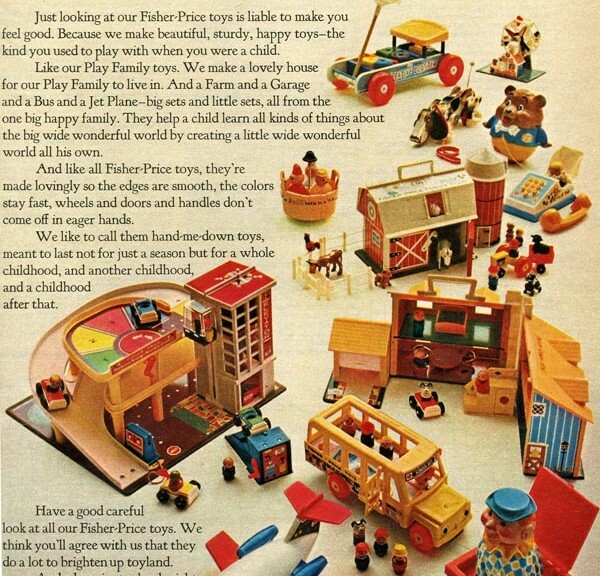 Last night’s show featured references to toys, Dow, Buick, and first aid, among other things. 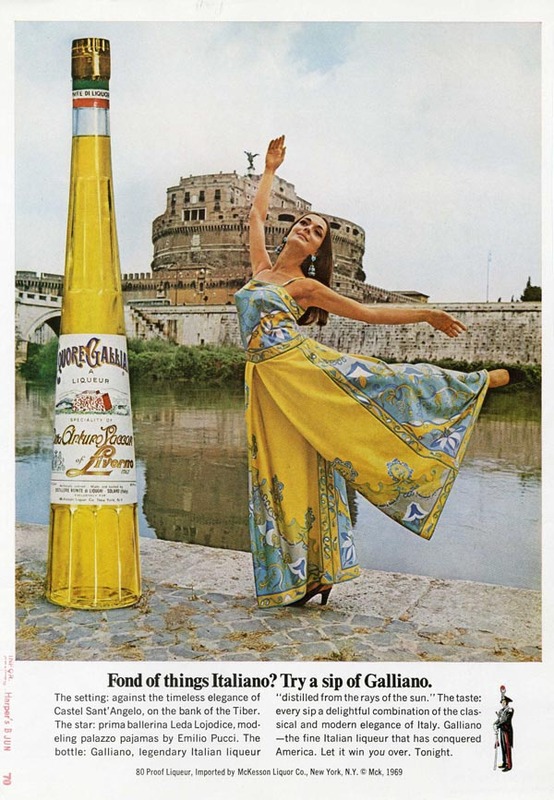 Enjoy our selection of highlighted ads that reflect the brands and themes that Mad Men characters interacted with last night. Last night’s episode saw Don Draper struggling to see the future for both the ad agency and himself. The show opens with his realtor nagging him to get out of bed and replace the stained carpeting so she can sell his apartment. Joan travels to the Los Angeles office to hire new staff with Lou Avery. She meets a retired gentleman named Richard who wanders into the office. They quickly hit it off and romance blooms. Shortly after she returns home he calls from New York and they go out again. Despite being very attracted to Joan, Richard later says he is disappointed to find out she has a young son, as he is more interested in a life of leisure and adventure. She leaves angrily. Peggy, Ed and Mathis struggle to come up with creative work for Tinkerbell Cookies. Mathis bickers with Ed during the client pitch and ends up swearing in front of the clients. Later he tries a Don Draper line to rectify the situation and save face, which falls flat and gets him fired. Sally is busy getting ready for a 12 state teen summer bus trip. Glen Bishop stops by to tell her that he is enlisting in the army, which upsets Sally. Later Sally tries to make amends, but can’t reach Glen by phone. Betty is surprised to see Glen after so long and they reconnect after Sally leaves for her trip when he tells her that he enlisted because he flunked out of college. She attempts to reassure him and he tries to kiss her. She thwarts his advance, but clearly shows some care and affection for him. Richard comes to the agency with flowers to apologize for his behavior and says he wants to be a part of Joan’s life. She accepts his apology. Don takes Sally and a few of her friends out for Chinese food before their bus trip leaves. One of her friends is flirtatious with Don, which irritates Sally. At the bus station Sally tells him that her goal in life is to get away from him and Betty and be a different person. The episode ends with Don walking into his empty apartment to find that his realtor is in the middle of completing a contract on his apartment with a young couple. She ushers him out the door and says to him that now they just need to find him a place. He goes out to the hall and seems somewhat overwhelmed at what the future might bring. Last night’s show featured references to grapefruit, Sanka, travelers checks and carpeting, among other things. 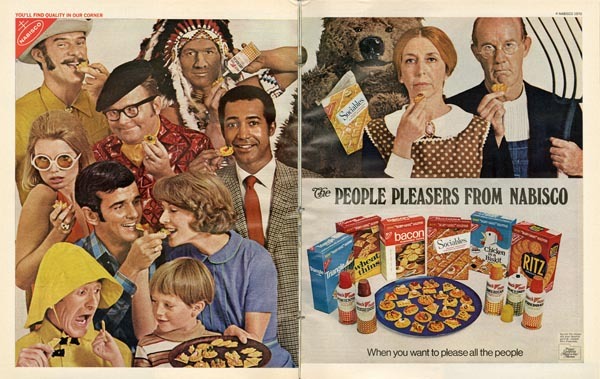 Enjoy our selection of highlighted ads that reflect the brands and themes that Mad Men characters interacted with last night. Last night’s episode began and ended with scenes focusing on things that Don has lost in his life. At the Francis house, Don makes a milkshake for his sons. Betty and Henry come home and Don wistfully watches his family chatting together then leaves alone. Megan calls to ask Don for $500 for the movers. She wants them to “just sign the papers and be done with this” and is tired of asking for an allowance. Don tracks down Diana at a steakhouse. He wants to have dinner with her “even if it’s five minutes at a time.” Later she comes to his apartment in the middle of the night. They talk about their divorces and her past. 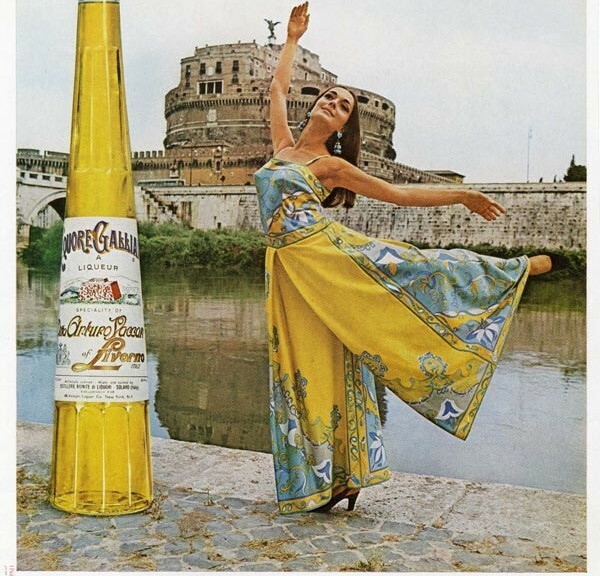 Peggy hires renowned photographer Pima Ryan for the Cinzano shoot. Stan scoffs at first, but then wants Pima to look at his work. Pima seduces him, and later makes a pass at Peggy. They both realize that Pima took advantage of them. Megan’s mother, Marie, criticizes Megan for letting Don off so easy. Megan’s sister implies that Megan is a failure because of her divorce. Marie is left to supervise the movers at Don’s apartment and fills the whole moving truck with Don’s furniture. Marie calls Roger asking for cash to pay the mover. He arrives at Don’s apartment with the money and Marie rekindles their previous affair. Harry and Megan meet for lunch to discuss her acting career. He flatters Megan, but then makes a pass at her. She leaves in disgust. She goes back to Don’s apartment, shocked to discover it empty except for Roger and Marie. Megan scolds them both and leaves. Don and Megan meet in the attorney’s office. Megan accuses him of ruining her life. Don writes her a check for a million dollars. “I want you to have the life you deserve,” he says. She takes the check and gives Don her wedding ring. Don arrives at Diana’s tiny apartment. He is ready for a new start and gives her a book about New York City. Diana insists that she can’t see him anymore because she forgot about the daughter she abandoned while with Don and she never wants to do that. Don goes home to find his apartment completely empty. Last night’s episode featured references to blenders, Life Cereal, Cinzano vermouth, photography, Champagne, and Tab, among other things. 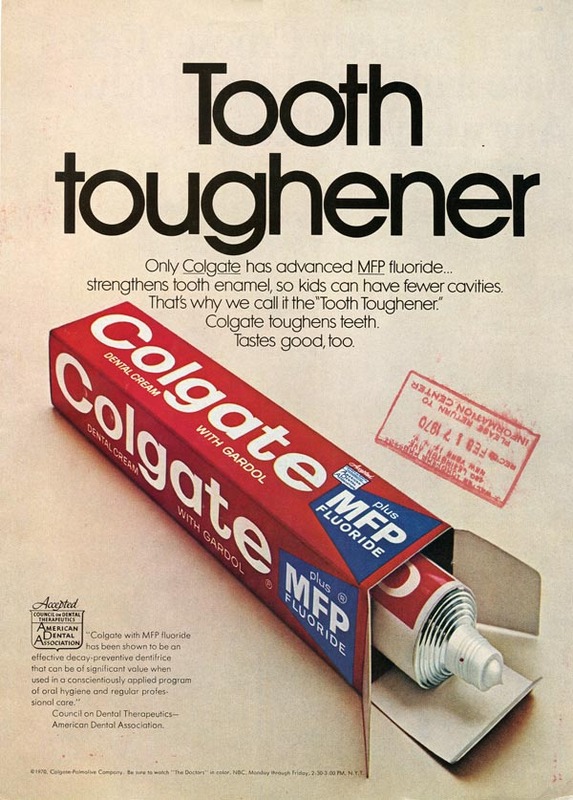 Enjoy our selection of highlighted ads that reflect the brands and themes that Mad Men characters interacted with last night. Mad Men is back! This half-season premier felt like an extended dream sequence with Peggy Lee’s eerie hit “Is That All There Is?” bookending the episode. The episode opens with Don holding a cup of vending machine coffee and a lit cigarette while posing a woman wearing nothing but a pricy fur coat—Don, the eternal misogynist. The scene widens to reveal that he is in fact working a casting call at the office. Mathis attempts to set up Peggy on a blind date with his brother-in-law. After some initial resistance she eventually acquiesces. While something of a milquetoast—he won’t even return an incorrect food order—the date goes well and, after some wine and a bottle of Galliano, the date nearly culminates in a spontaneous trip to Paris. Instead, the couple settles for a phone call in two weeks. 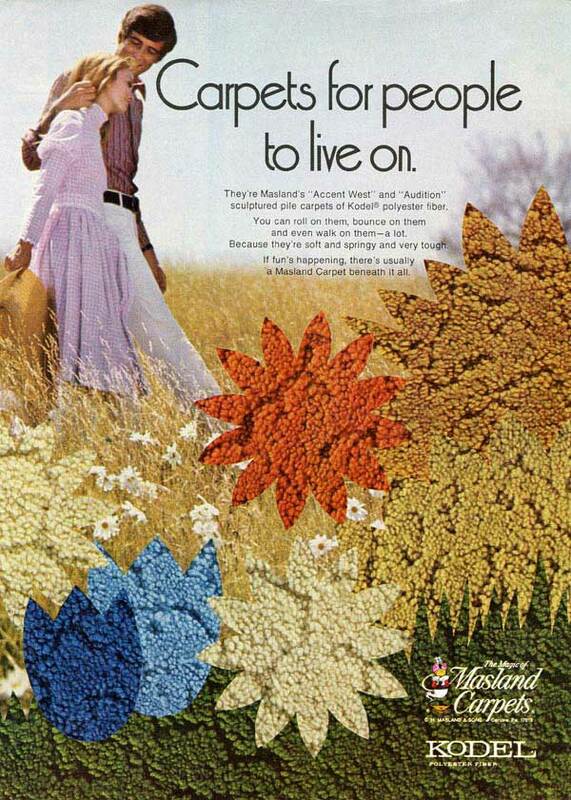 Fearing the toll that the advertising industry is taking on his psyche, Ken Cosgrove’s wife tries to persuade him to get out of the advertising business and focus on his writing. 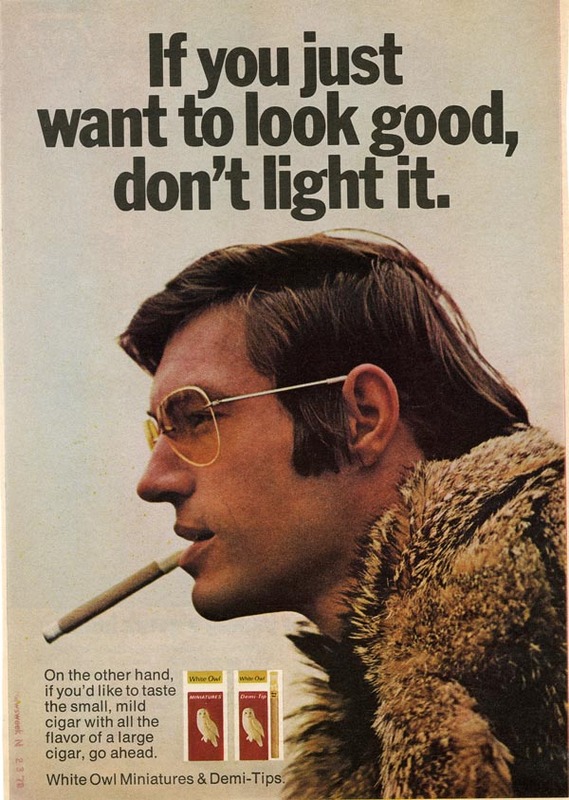 The following day, at the behest of a McCann-Erickson executive, Ken is fired by Roger. While expressing some bitterness at Roger’s lack of loyalty, he chooses to interpret the moment as kismet, an opportunity. 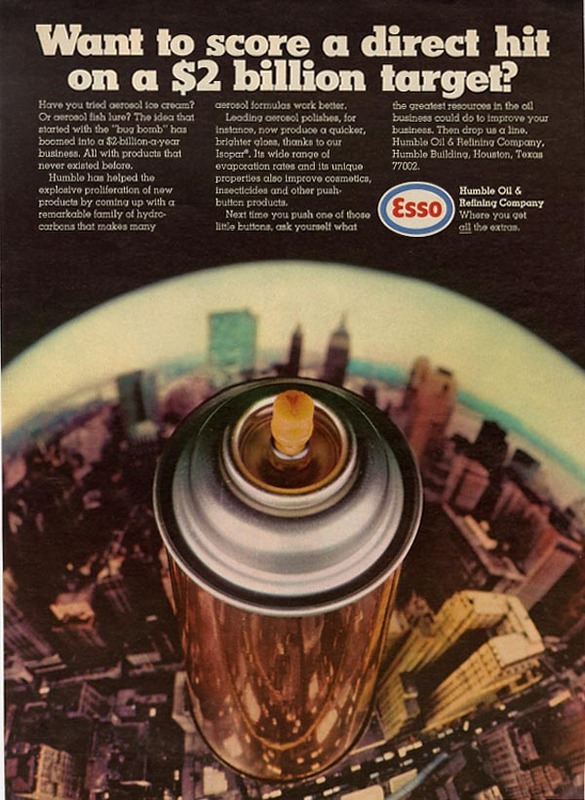 Rather than focus on his writing he listens to his competitive instincts and accepts a position as director of advertising for Dow Chemical. Rather than pulling Dow’s business from the SC&P he vows to be a difficult client to please in the future. Peggy and Joan have an encounter of their own with the heavy-handed and none-to-subtle staff of McCann. 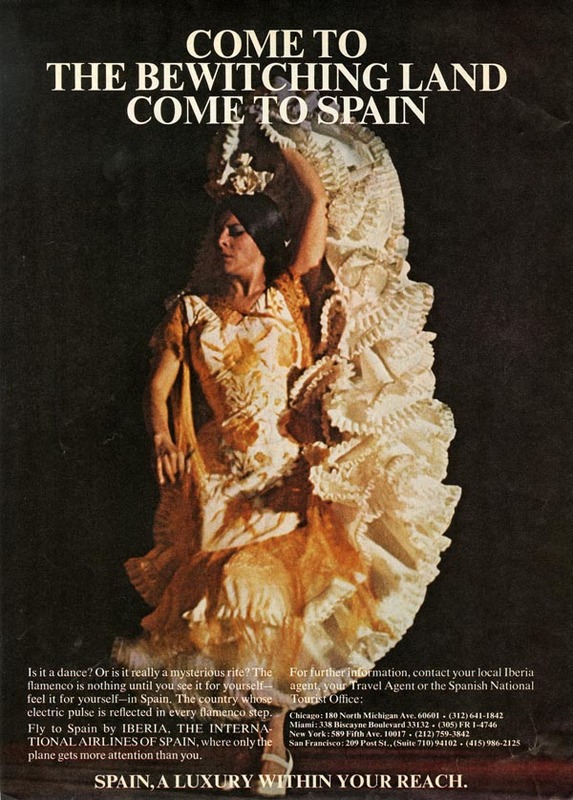 On behalf of SC&P’s client Topaz pantyhose, together they pitch the possibility of McCann introducing them to some of their department store clients. After a few minutes of crude innuendo from the McCann reps, Peggy finally persuades them to take a look at the proposal. Rather than a bonding experience the meeting results in an elevator argument between Peggy and Joan over the meeting’s takeaway lessons. After a vision (dream?) of Rachel Katz, his brief fling from season 1, in Chinchilla fur, Don attempts to set-up a meeting with her under the auspices of a potential partnership between her department store and Topaz pantyhose only to learn that she has recently passed from an illness. Perhaps it’s the memory of Rachel that informs his continued attraction to the mysterious waitress at the late-night diner. With Rachel’s family sitting shiva, Don attempts to pay his respects only to be cast out. Finding his way to the diner, he attempts to connect with the waitress only to be told that the tryst was merely just compensation for the large cash tip from a previous evening. Last night’s episode featured references to toasters, L’eggs hosiery, wine stained carpet, veal, pop tarts, and Paris.